Helicopter Route Charts are four-color charts that depict current aeronautical information useful to helicopter pilots navigating in areas with high concentrations of helicopter activity. 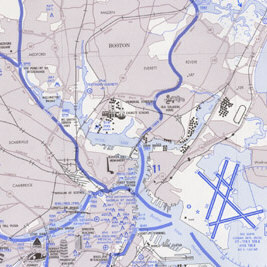 Information depicted includes helicopter routes, four classes of heliports with associated frequency and lighting capabilities, NAVAIDS, and obstructions. In addition, pictorial symbols, roads, and easily-identified geographical features are portrayed. Since helicopter charts have a longer life span than other FAA products, all new editions of these charts will be printed on synthetic paper. These charts are updated as requested.